Netbook oldie. 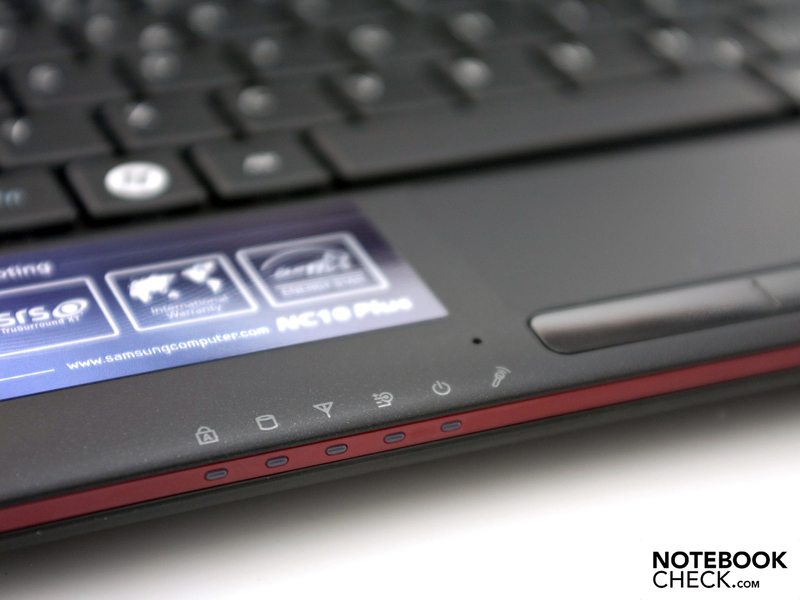 We take a look at the Samsung NC10 Ecko Plus, a tried and tested machine with older Intel hardware and a black case. Its performance is not the best by any means, but its current entry-level price is appealing. 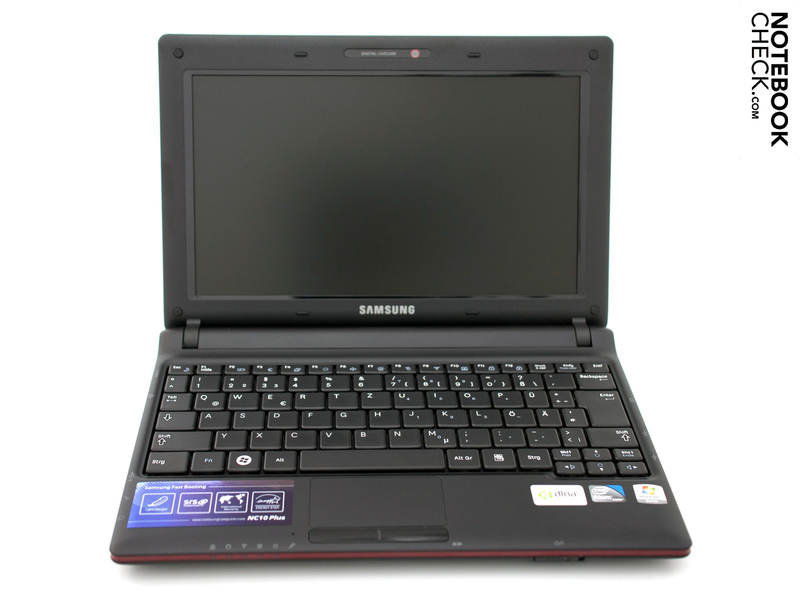 The NC10 Ecko Plus (model JP01DE) and NC10 Emi Plus are Samsung’s remake of the first generation, which came with Intel Atom N270 processors. The case and matt 10-inch screen with a native resolution of 1024 x 600 have been altered only slightly. The South Korean conglomerate Samsung also used the same basic construction in the N145 and N150 series. 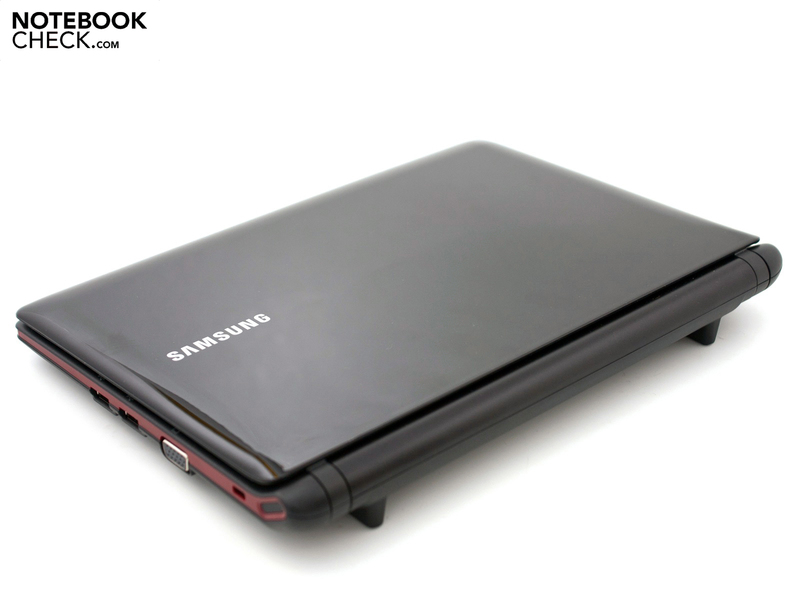 Depending on your taste you can get this ‘new’ Samsung netbook in black (Ecko Plus) or white (Emi Plus). 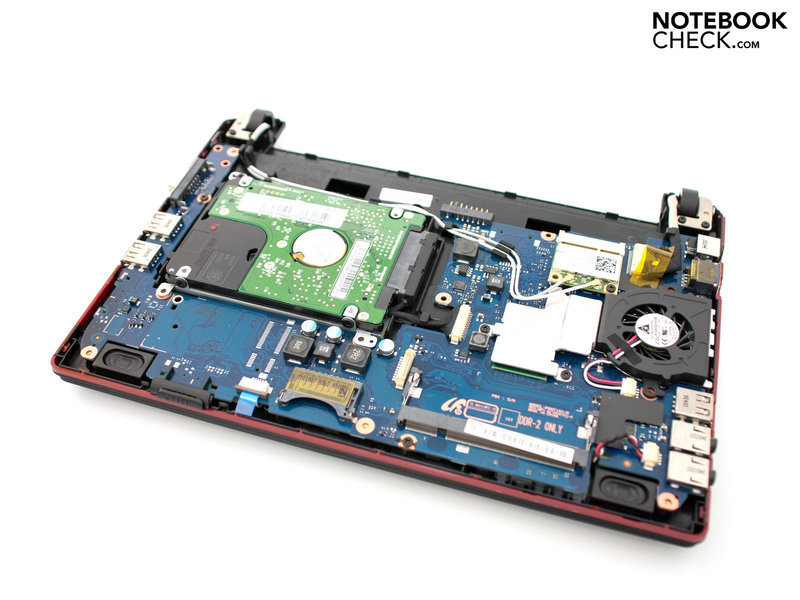 Inside the netbook is an Intel Atom N455 single-core CPU, which is no longer current, with 1.66 GHz and an integrated GMA 3150 graphics unit which can also be found in the latest Intel Atom N550. The rest of the hardware is unexceptional, with 1 GB of DDR2 RAM, 250 GB of hard drive space, and 802.11 b/g/n WLAN. New for this model is the powered USB 2.0 port and a Bluetooth 3.0 + HS module made by Broadcom. This hardware has been discussed many times before and is covered in our comprehensive reviews of the Samsung N145 and N150 Eom with 3G, which are identically constructed. 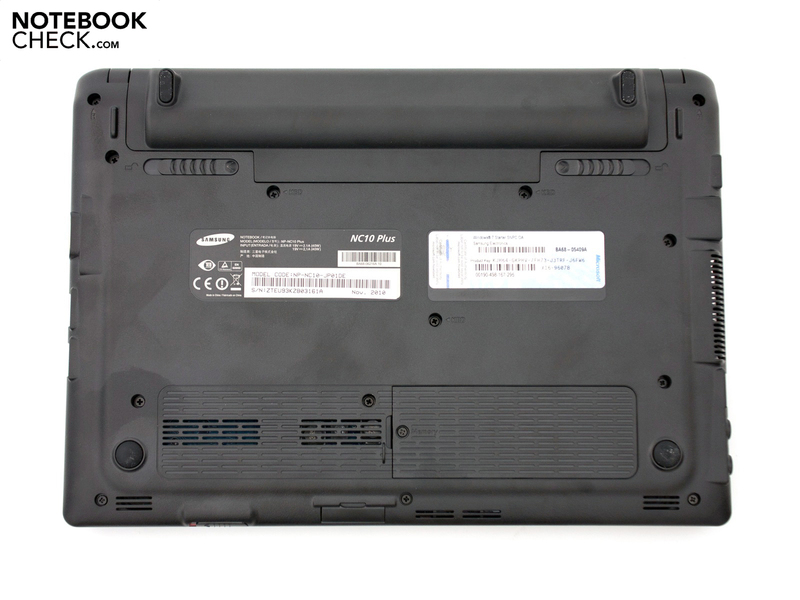 Therefore we will not dwell on elements such as the design, the ports or the system performance in this review, as this netbook has not changed significantly in any of these respects. 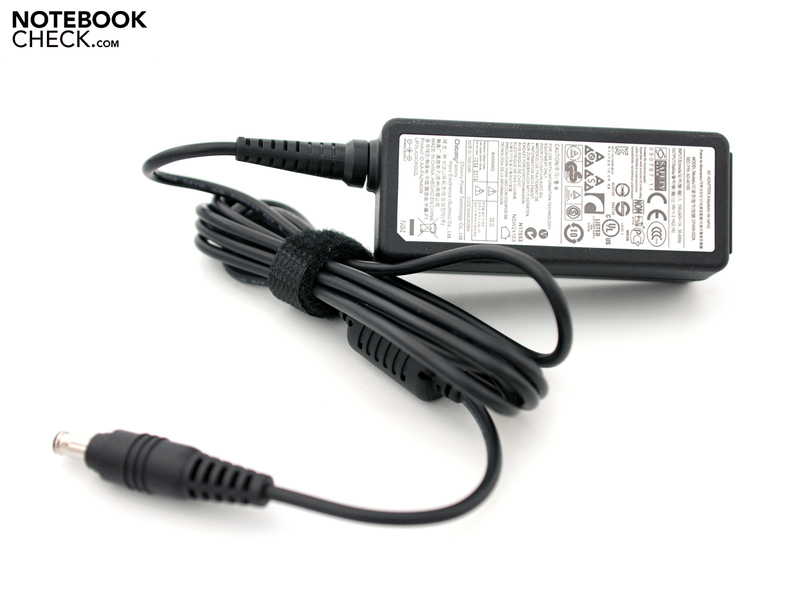 Detailed information on these areas can be found in the reviews for the above-mentioned netbooks. 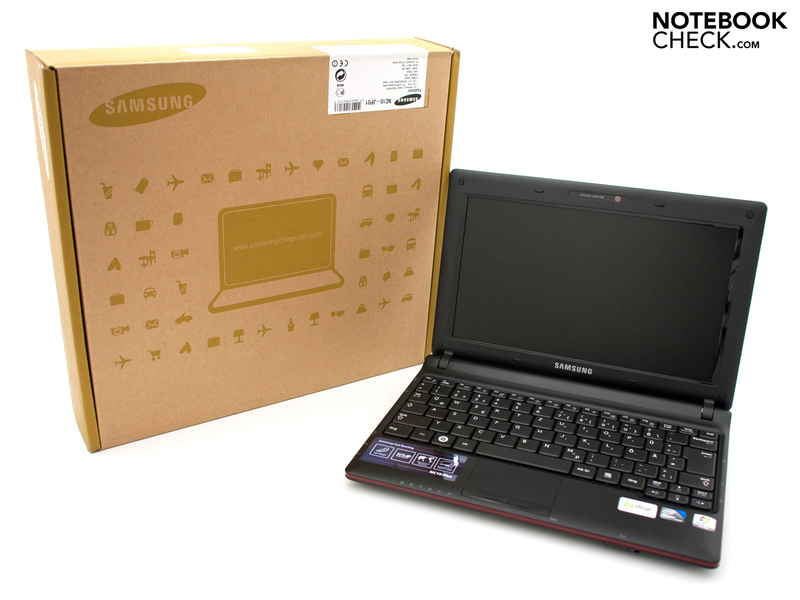 The Samsung NC10 is interesting, in this age of dual-core processors, because it is very favourably priced. Samsung’s recommended retail price is still €329, but some online retailers are offering the netbook for as little as €239 plus shipping. As already mentioned, the range of ports has not changed significantly. 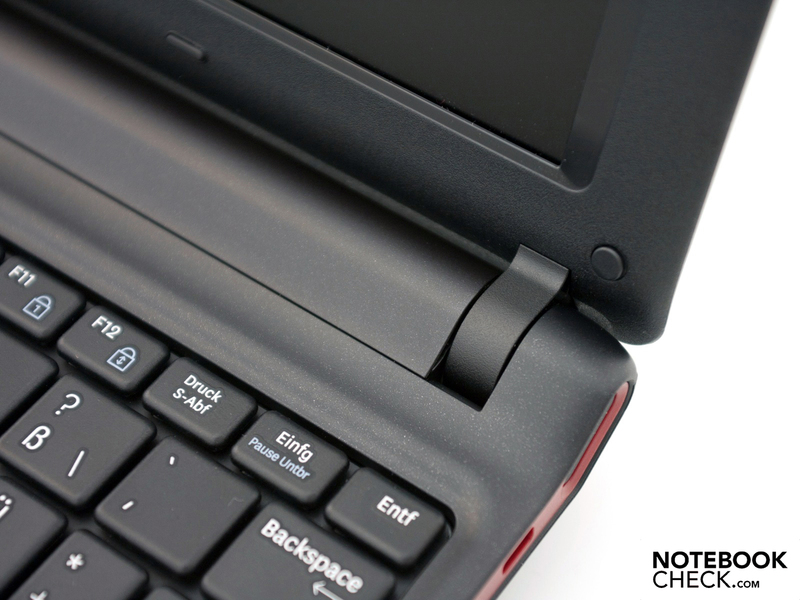 Typically for a netbook, the NC10 offers three USB 2.0 ports, a VGA port for connecting an external monitor and a LAN Ethernet port. The new features like the powered USB port or Bluetooth 3.0, provided you use such things, are a definite bonus. 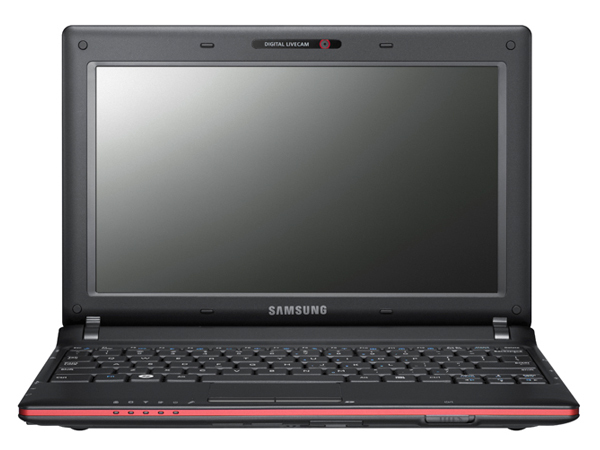 Samsung has not updated the netbook’s wired connectivity, with the Marvel Yukon controller only offering the older 10/100 MBit standard. On the other hand, 802.11 b/g/n WLAN and Bluetooth 3.0 + HS are both supported via Broadcom modules. 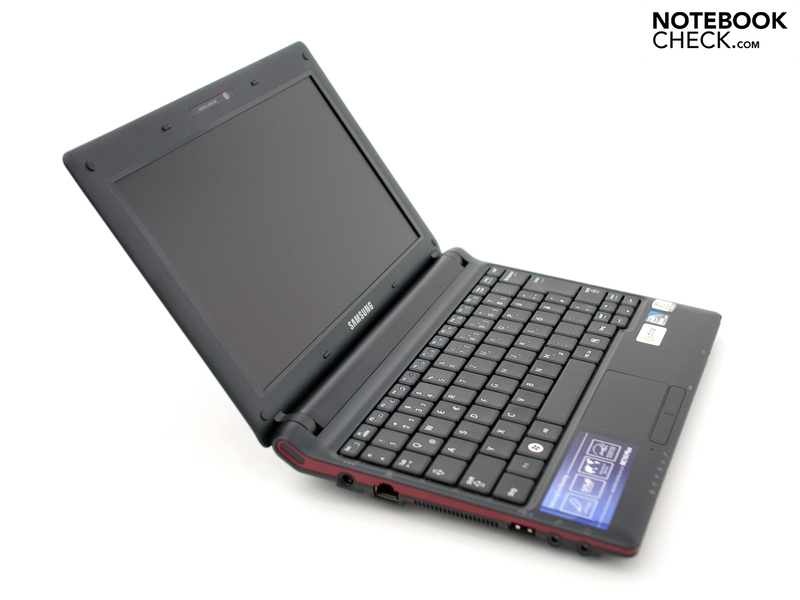 There is no UMTS-capable model in the NC10 series; but for this you could turn to Samsung’s older N150 Eom netbook or to the current NF210-HZ1 with Intel Atom N550 CPU. Netbooks in this price range generally come with very few freebies. Other than the netbook itself, all you get is the mains adaptor and power cable, the six-cell battery and various informational booklets. 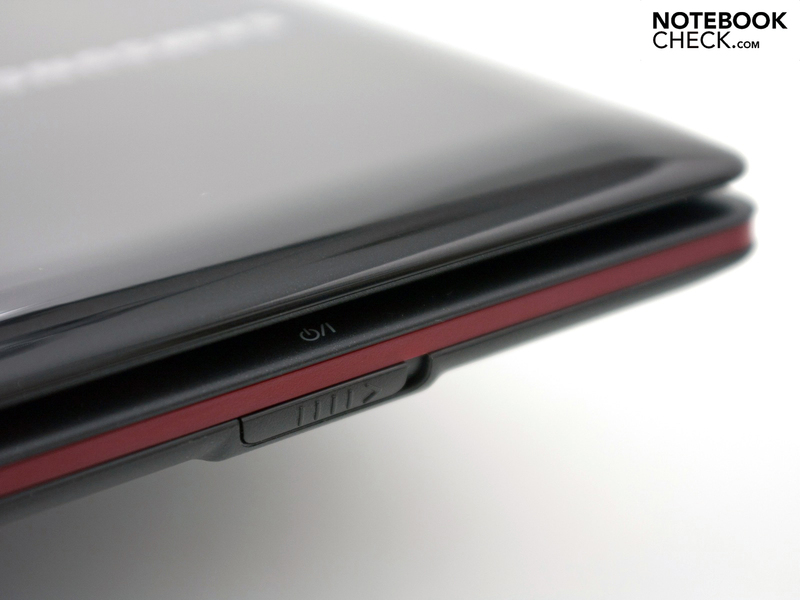 Samsung does offer around 15 optional extras that you can purchase for the NC10 Ecko Plus. 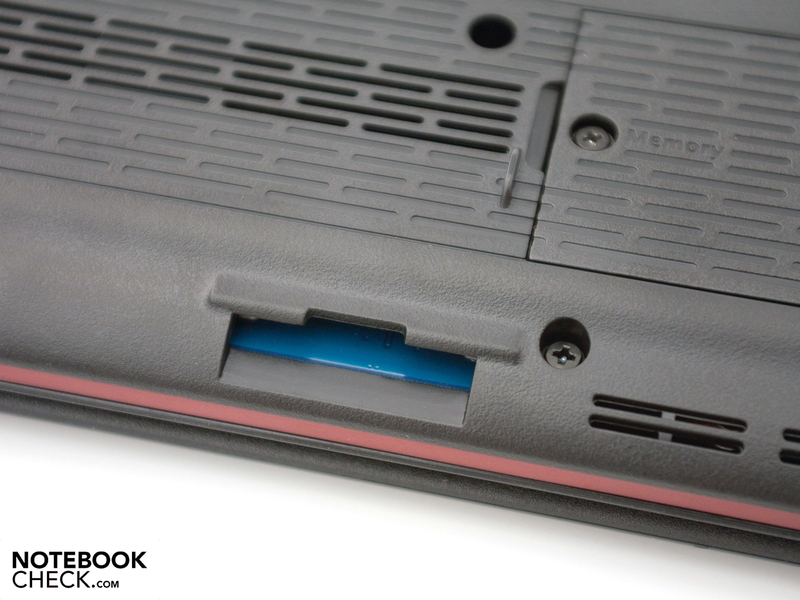 These include a high-performance battery with 5900 mAh (€139), a 2 GB module of RAM (€89), an in-car charging device (€146), a replacement mains adaptor (€39), external drives (€89 to 219) and other peripherals. The basic warranty is 24 months, and can be extended to 36 or 48 months if desired. These service upgrades must be activated within 90 days of purchase, according to Samsung, and cost an additional €59 or €89 respectively. 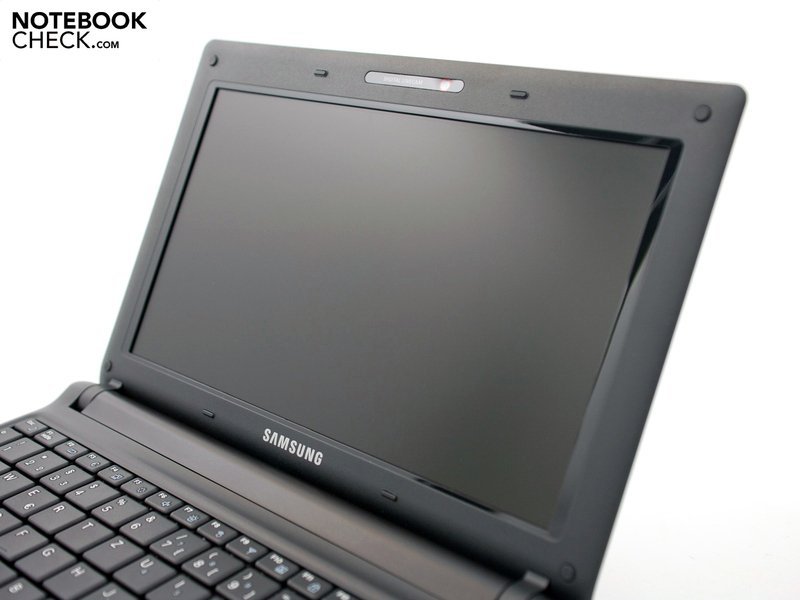 The screen is an important factor when it comes to netbooks, as they are more likely to be used outside. 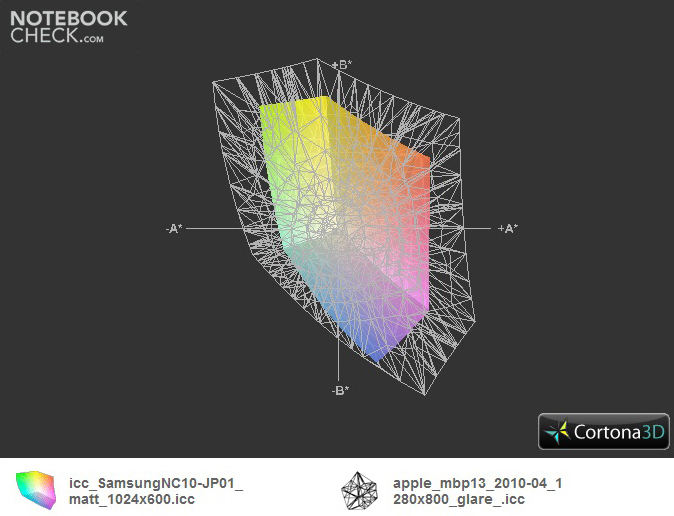 Samsung has gone for a 10.1-inch screen with a matt finish and a native resolution of 1024 x 600, in a 16:9 format. 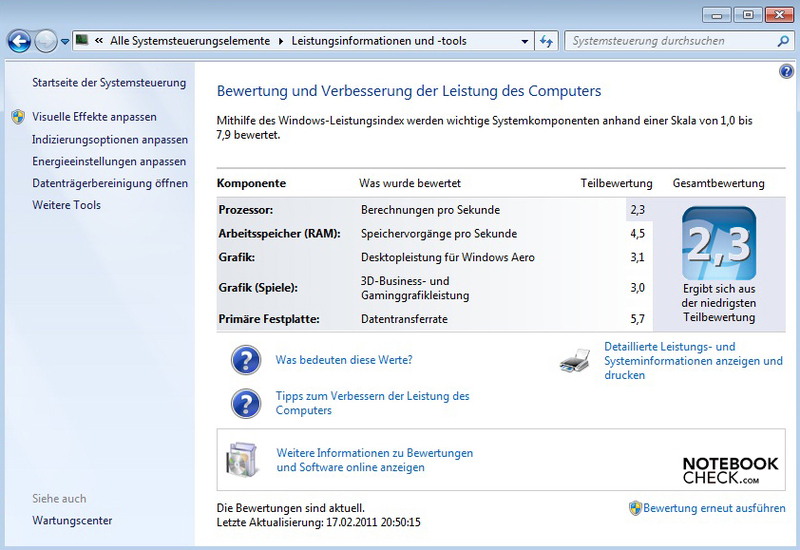 In Microsoft Windows 7 Starter there are also two higher (interpolated) resolution settings available. Under system settings you can select 1024 x 768 or 1152 x 864. The picture quality when using an external screen over the analogue VGA connection is good, with a resolution of up to 1920 x 1080 (Full HD, 1080p). 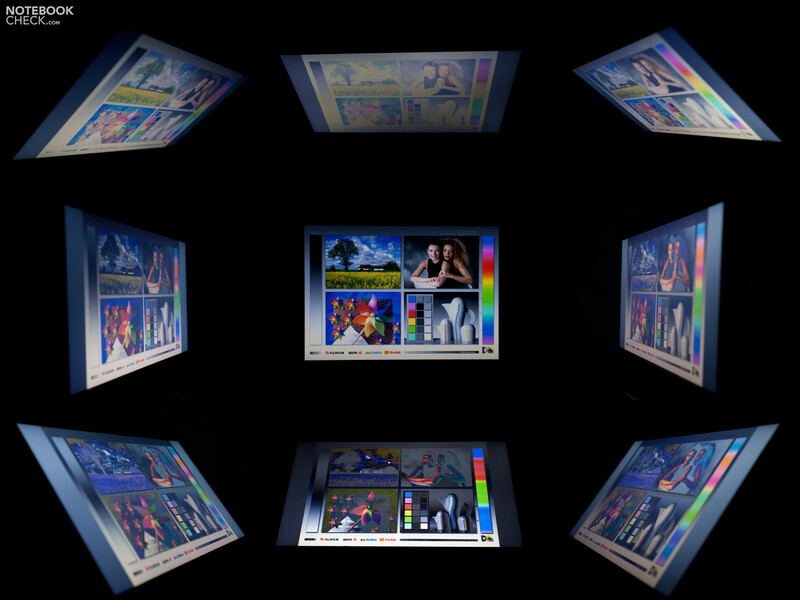 Integrated LED backlighting gives the screen a good level of brightness while maintaining the slim profile of the lid. 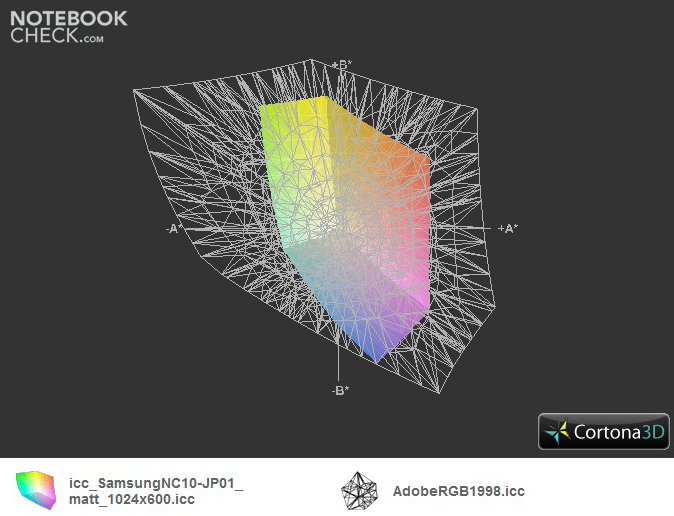 The maximum brightness of 225 cd/m² and average of around 215 cd/m² is convincing, but not on a par with the Asus Eee PC R101. 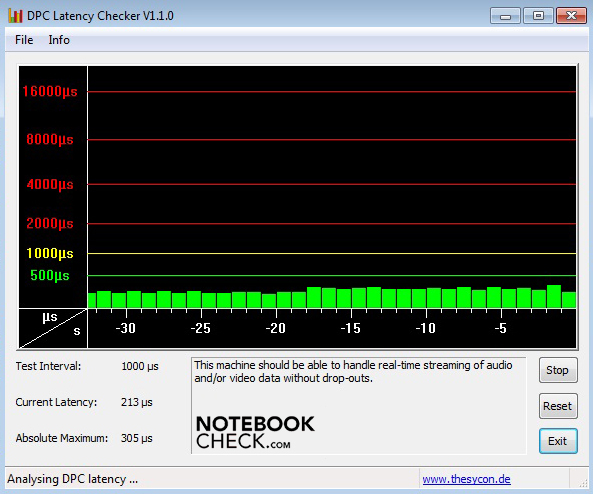 However, the latter is very unusual for a netbook, with brightness readings of over 300 cd/m². The uniformity of brightness is very good at 92%, with only minor variations across the screen. 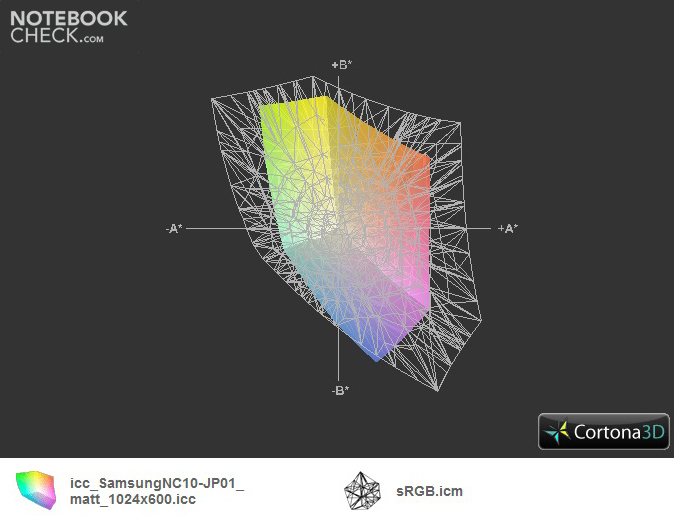 Less impressive is the elevated black level of 2.11 cd/m² and the poor contrast ratio of 106:1 that results from it. Our subjective impression of the picture clarity and colour reproduction was a good one. It is possible to use the netbook outside thanks to the acceptable screen brightness and matt surface. Outdoors and with light shining directly on the screen, it is harder to work because of the low contrast. Colours fade noticeably, but there are no reflections. 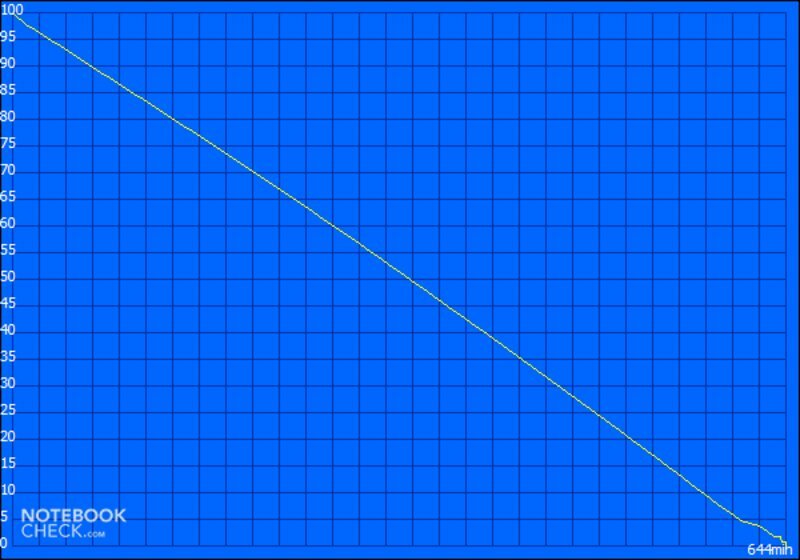 The viewing angles fall within the usual range. Horizontally the picture remains stable even at quite large angles. 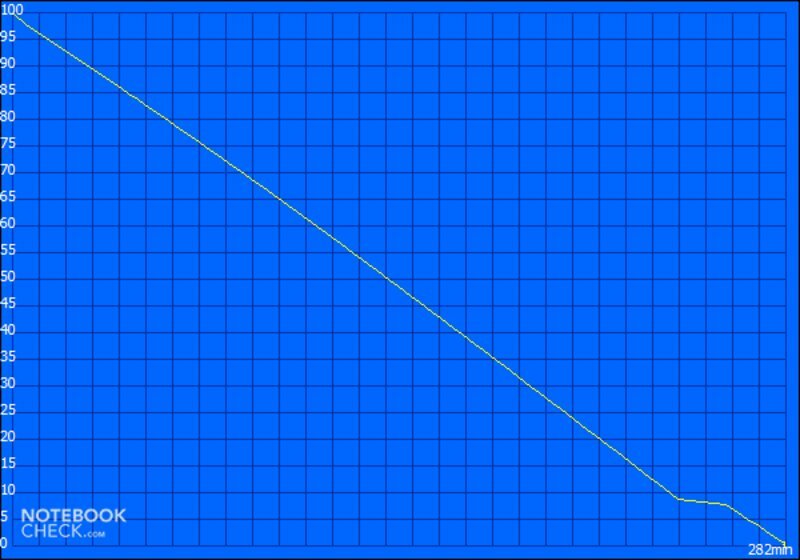 When the vertical angle was changed, the colours on our test picture started to invert relatively quickly. 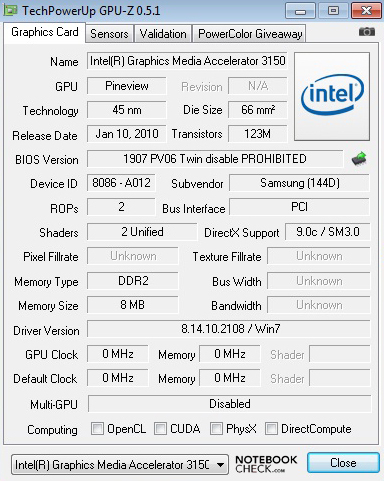 The NC10 Ecko Plus is based on Intel’s Pine Trail platform. 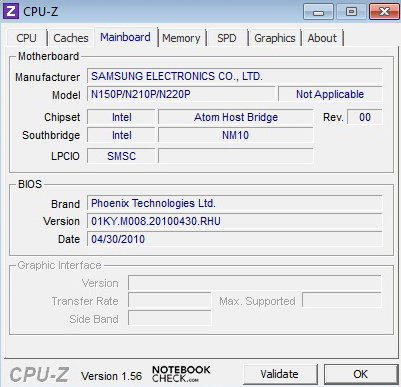 The Intel Atom N455 Single-Core Prozessor (1.66 GHz, 512 KB L2 cache, 667 MHz FSB) with an integrated Intel GMA 3150 graphics unit (200 MHz core speed) is already old hat, about a year after its release. Modern processing units like the AMD C-50 APU come with two cores and support HD video content. 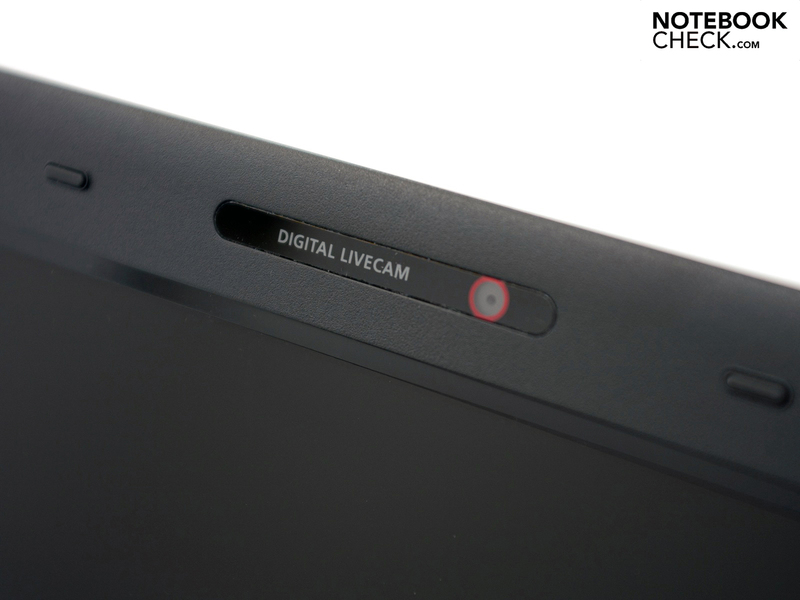 The application performance is not noticeably better than that of the Atom N450 processor. Thanks to Hyper-threading technology, a second virtual core can come to the aid of the one physical core. 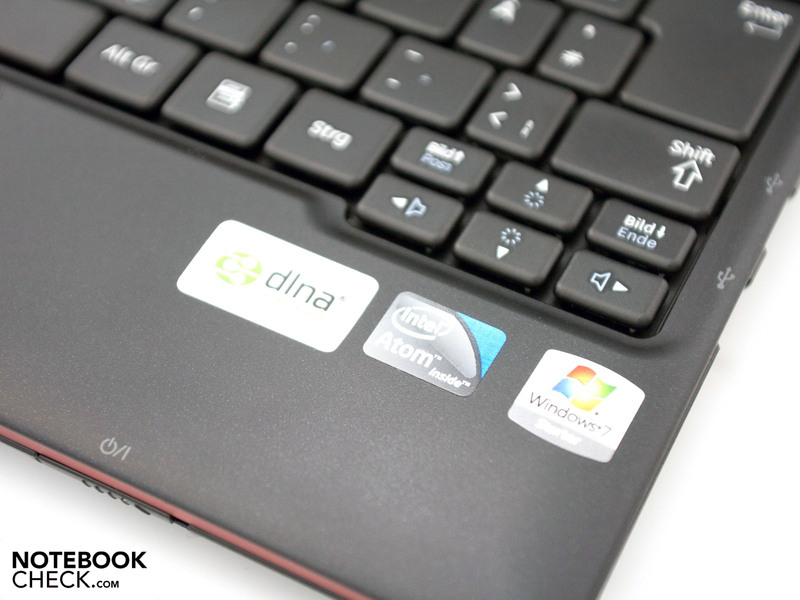 The netbook is by no means a multimedia or gaming whizz, but the performance is perfectly sufficient for simple office applications. 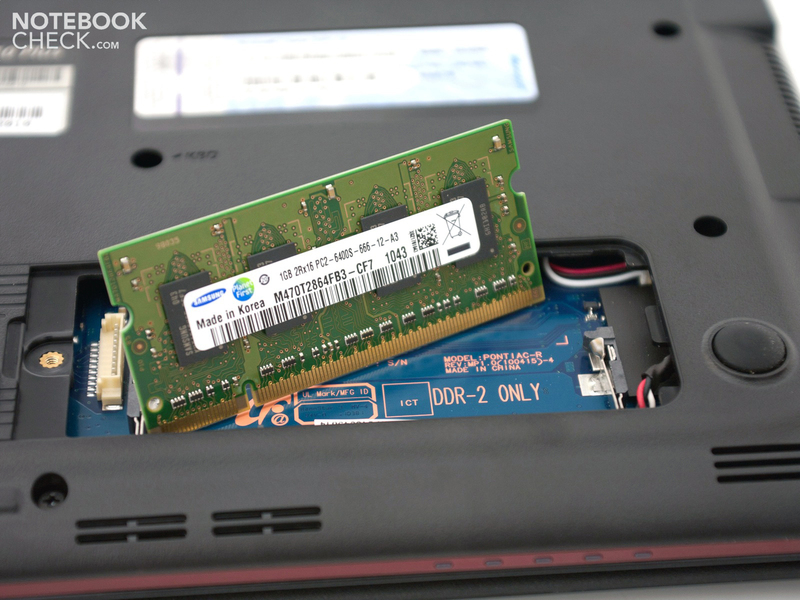 The netbook also comes fitted with 1 GB of DDR2 6400S RAM (800 MHz) and a 250 GB hard drive. 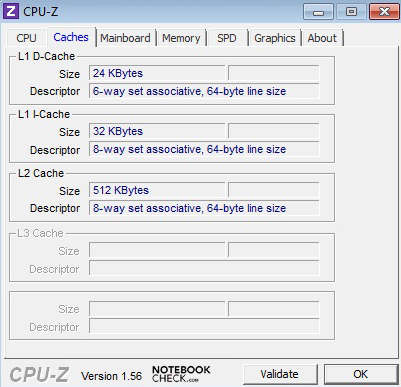 If you try to multitask with this netbook you will suffer reduced speed and more lag, but this is normal for single-core systems. Samsung have chosen a Western Digital Scorpio Blue hard drive (model WD2500BEVT-35A23), a straightforward 2.5-inch drive with a 250 GB capacity and 5,400 rpm. 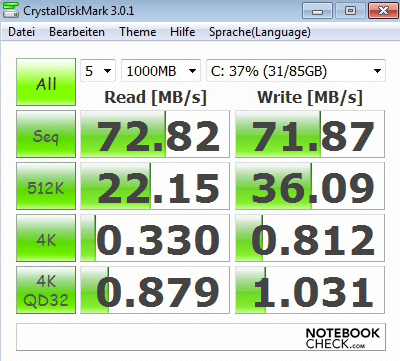 The maximum reading transfer rate of 61.5 MB/s (HD Tune Pro 4.6) or 72.82 MB/s (CrystalDiskMark) is about average. The average access time of 19.4 milliseconds is slightly better than expected. 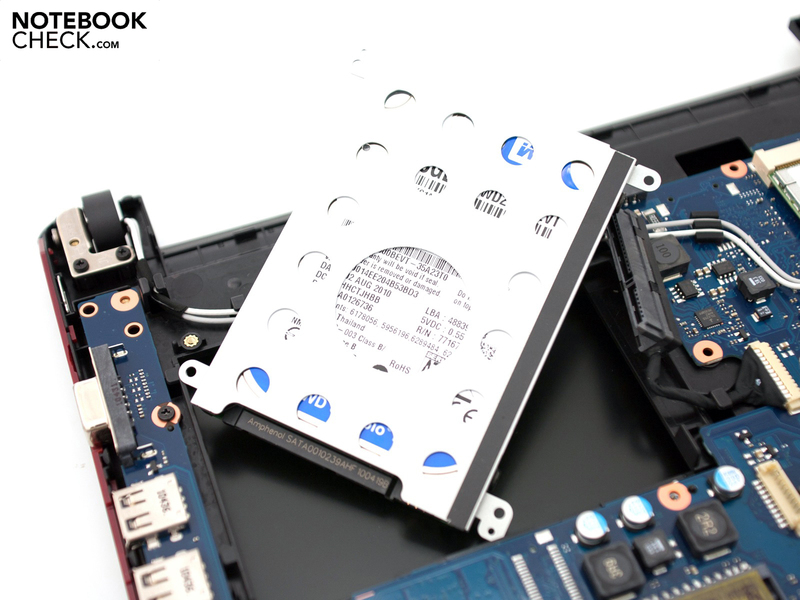 It would be easy to upgrade to a faster hard drive or a solid state drive (SSD) if you remove the base plate on the underside of the netbook, but this doesn’t generally get you much more speed, as the single-core processor is the limiting factor. The Samsung NC10 is quiet and reserved; producing noise levels of between 30.4 dB(A) in idle and 31.1 dB(A) under stress, it is barely noticeable. 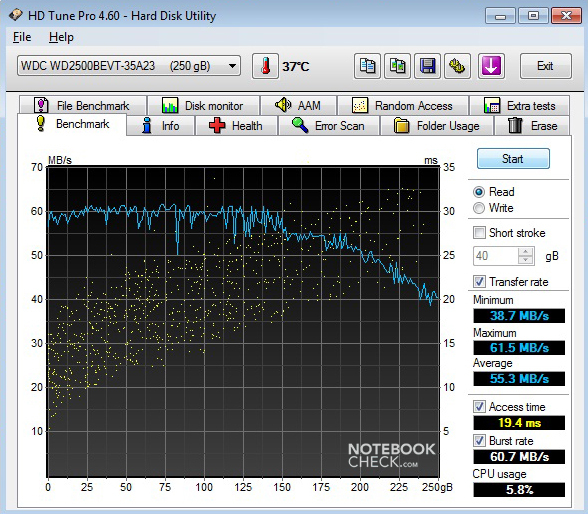 The hard drive also remains unobtrusively in the background at 30.8 dB(A). Overall, a convincing performance, and one that other netbooks would do well to emulate. 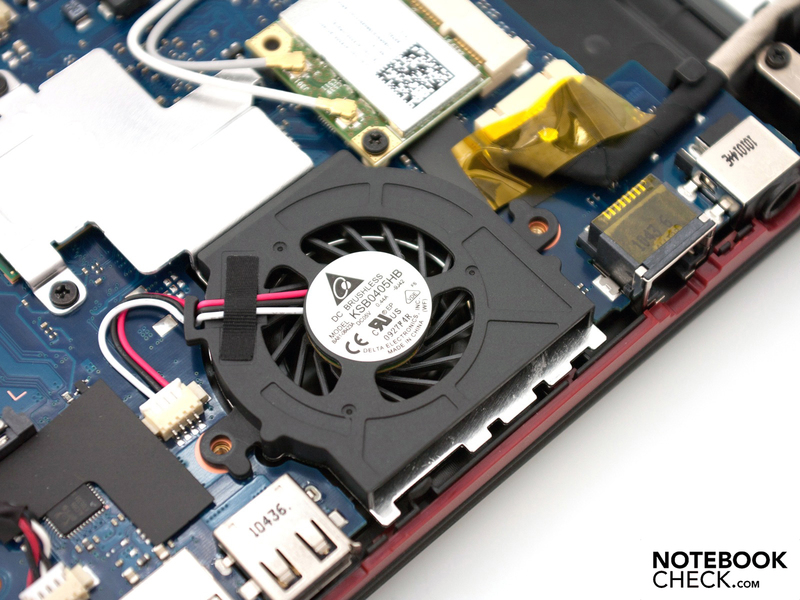 The small fan on the left side of the chassis is directly connected to the heat sink, allowing for very efficient cooling. In idle the fan is hardly active (silent mode), with mildly elevated temperature readings on the upper side of the base unit. The maximum reading of 35 degrees Celsius is still in the green zone, and feels only slightly warmer to the touch. Under stress, the fan kicks in and reduces the temperature readings to a maximum of 31.3 degrees Celsius. (+) The average temperature for the upper side under maximal load is 26.7 °C / 80 F, compared to the average of 29.8 °C / 86 F for the devices in the class Netbook. (+) The maximum temperature on the upper side is 29 °C / 84 F, compared to the average of 33 °C / 91 F, ranging from 21.6 to 53.2 °C for the class Netbook. (+) In idle usage, the average temperature for the upper side is 29 °C / 84 F, compared to the device average of 29.8 °C / 86 F.
(±) The average temperature of the palmrest area of similar devices was 29.3 °C / 84.7 F (-0.4 °C / -0.8 F). 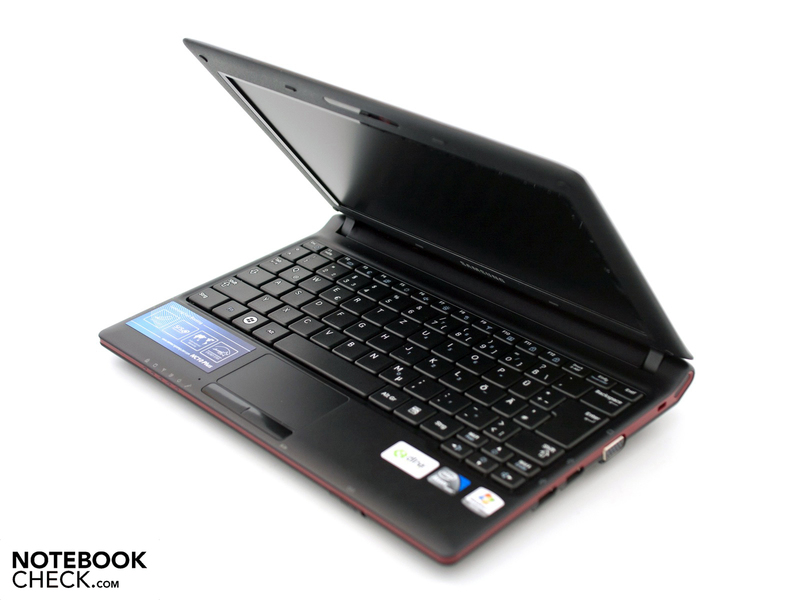 The two stereo-loudspeakers each offer 1.5 Watts of power and produce the usual netbook quality of sound. The high-tones and the volume itself are convincing, but the lower tones and bass notes are entirely absent. 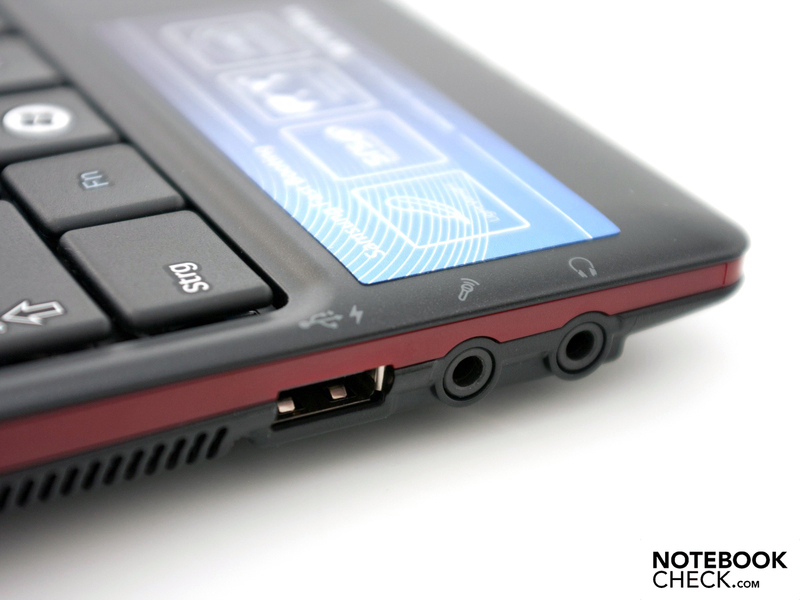 An external headset or speaker system can be connected via the 3.5 mm audio port; the sound quality using this method seemed good to us, with no unwanted noise in the background. 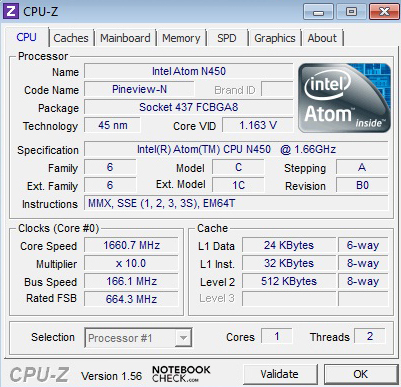 The Intel Atom N455, having a single processor core, should have low energy consumption. 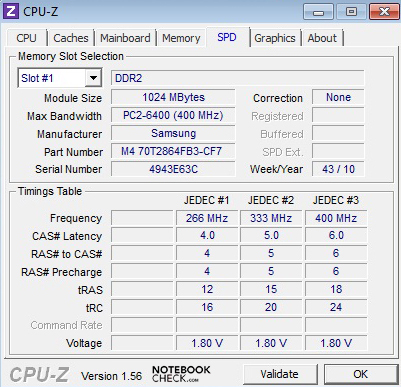 The thermal design power (TDP) is only 6.5 Watts. With minimal processing demands (idle use) we measured between 6.6 and 9.1 Watts (the whole system). Under stress the consumption rose to a maximum of 12.5 Watts. The low energy usage overall and the six-cell battery (4400 mAh, included) suggest good portability. 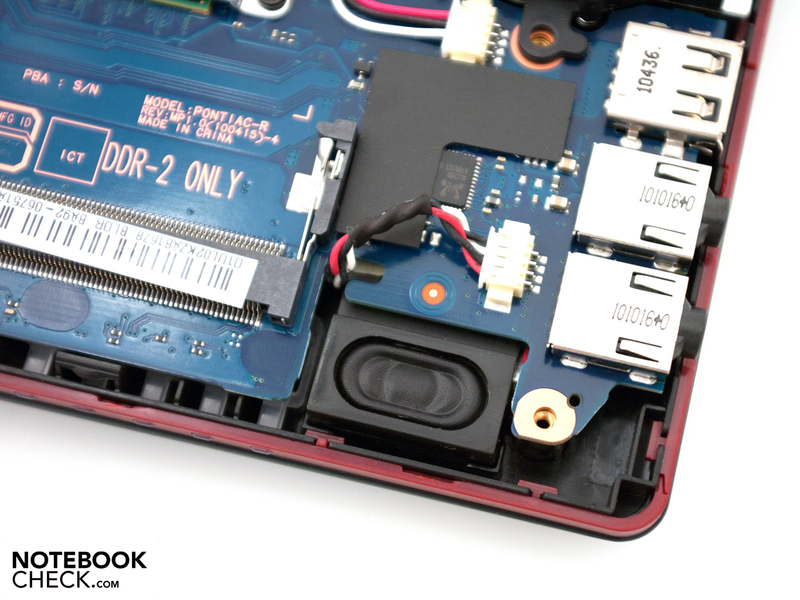 This means that the optional high-performance 6600 mAh battery is not urgently required. 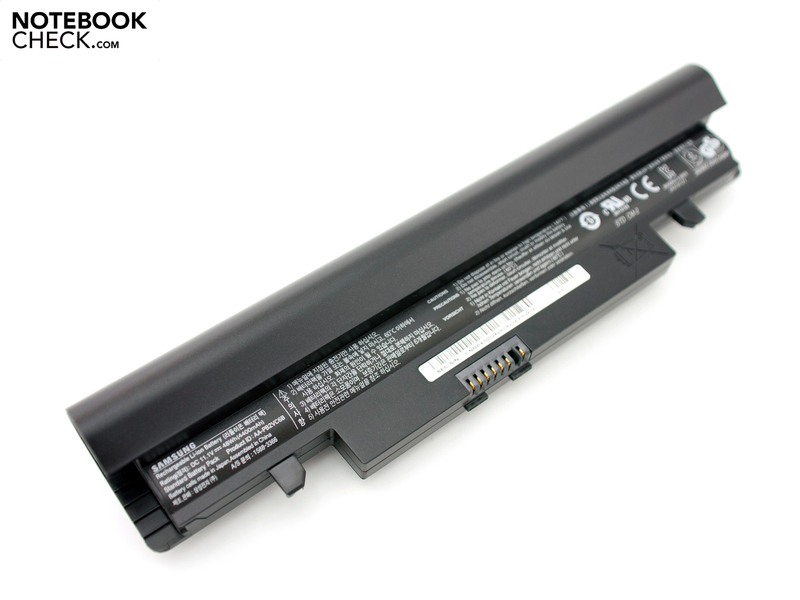 Energy-efficient hardware plus a six-cell battery generally results in good battery life for a netbook like this. At full load, with maximum screen brightness and WLAN adaptor switched on, the NC10 lasted for 4 hours 42 minutes in the ‘Classic’ Battery Eater test. For internet surfing with a comfortable screen brightness you can expect an impressive 7 hours and 25 minutes. The ‘Reader’s test’ is a measure of the maximum possible battery life, using minimum screen brightness and a deactivated WLAN module. 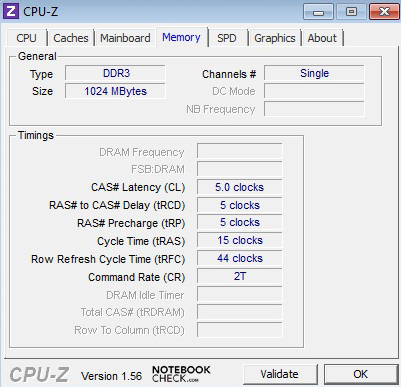 At 10 hours and 44 minutes the netbook achieves an excellent result, but you would not really be able to work comfortably with these settings. The result from the wireless surfing test is a more realistic indicator of battery life. 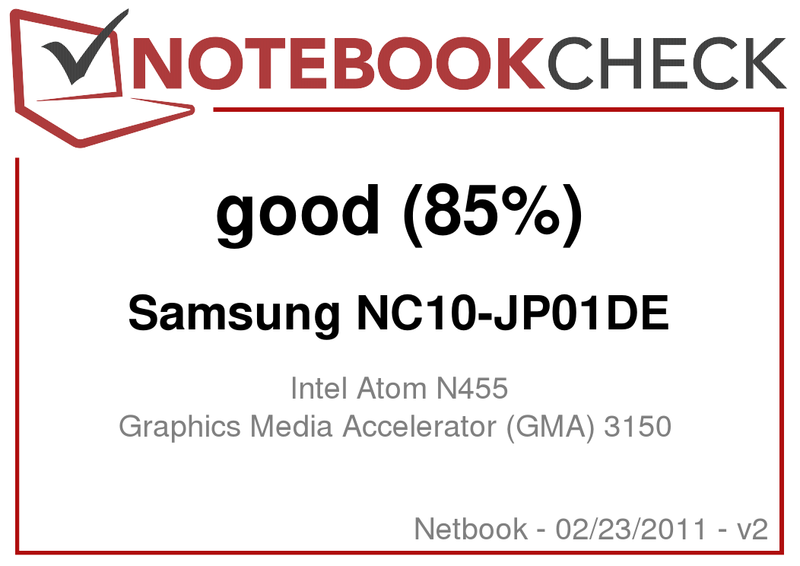 The Samsung NC10 Ecko Plus, despite its older Intel Atom N455 processor, is not a bad machine. The performance offered by the hardware is not stunning, but for simple office applications it is all that is needed. 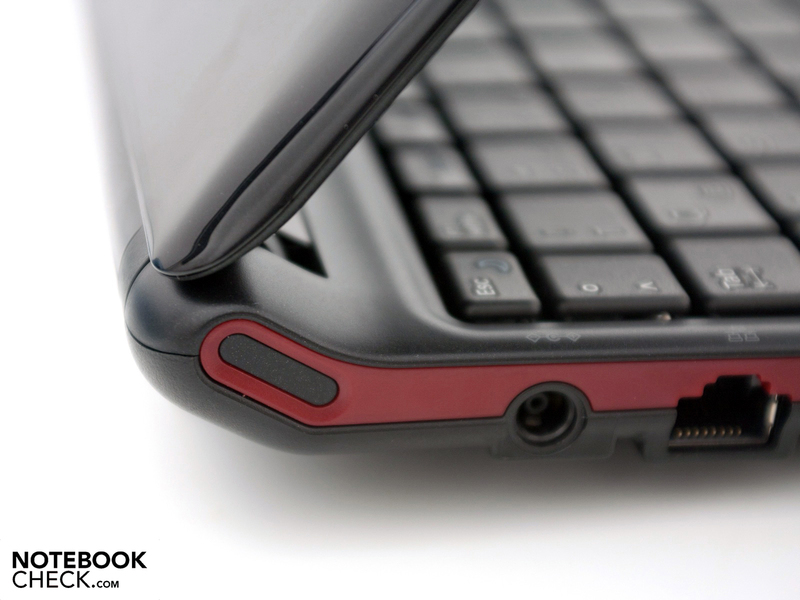 The matt case, the up-to-date wireless technology as well as the powered USB 2.0 port are all points in its favour. 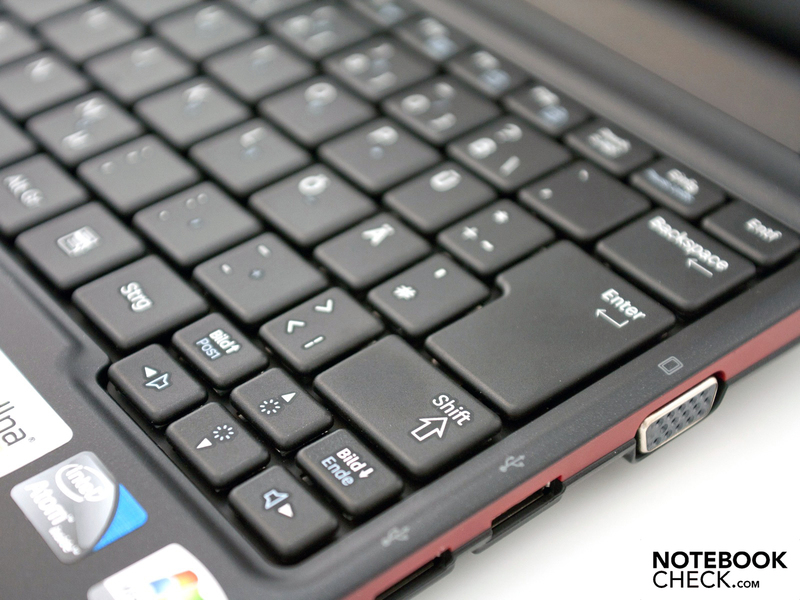 The matt screen and the comfortable keyboard (though some keys are too small) both add to the positive impression. On the negative side we could mention the netbook’s low screen contrast, its lack of freebies and its poor stereo-speakers. But this configuration has further strengths when it comes to emissions and battery life. The quiet and yet efficient cooling system is a pleasant surprise, as is the maximum battery life of more than 10 hours. If you’re looking for a reasonably priced ‘typewriter’ and can live with the usual deficiencies of a netbook, you could do a lot worse than this one. A major selling point is its current entry-level price of around €240, plus shipping. 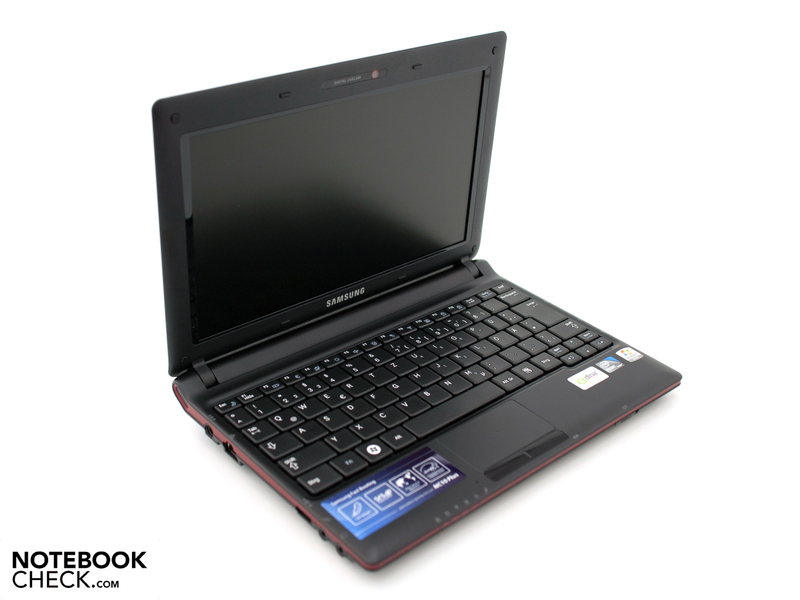 Modern netbooks with an Intel Atom N550 CPU or AMD C-50 currently start at around €300. The case being almost completely matt, the good keyboard and the matt screen finish. A somewhat better screen contrast. How long Intel’s single-core Atom CPUs have stayed on the market. Numerous netbooks with 10.1-inch screens. These include, for example, the Asus Eee PC R101 with its top-notch display, the Samsung NF210-HZ1 with Intel Atom N550 and 3G UMTS module, the Acer Aspire One D255 with N550, or the Samsung NF310 with a matt HD screen.